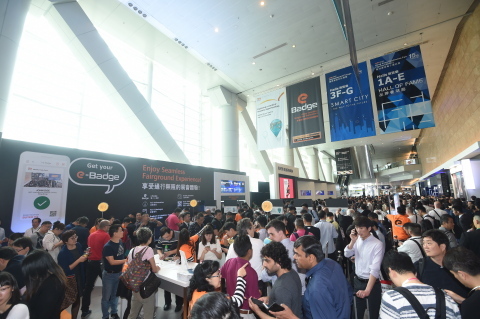 Themed under Smart City • Smart Living, the HKTDC International ICT Expo will be held at the Hong Kong Convention and Exhibition Centre from 13 to 16 April, presenting a range of solutions from smart economy, smart environment, smart government, smart living, smart mobility and smart people. The Office of the Government Chief Information Officer will set up the “Smart Government Pavilion” to showcase innovation and technology (I&T) initiatives such as electronic identity (eID), smart lamppost that can track traffic and collect environmental data, intelligent transport system with the use of in-vehicle unit and the use of virtual reality technology for training. The Pavilion will also feature the upcoming “Smart Government Innovation Lab” which aims to facilitate the adoption of I&T to enhance public services by inviting the industry to put forward proposals of I&T applications and product suggestions for addressing challenges in public services, and conducting trials and technology testing of suitable proposals. Running concurrently with ICT Expo is HKTDC Hong Kong Electronics Fair (Spring Edition).